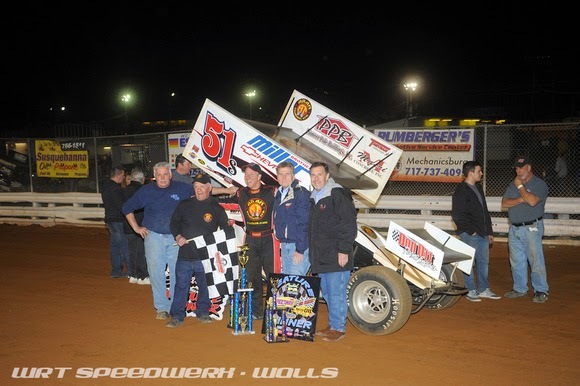 Mechanicsburg – Stevie Smith took over when leader Brent Marks made a miscue in traffic to record the $6,000 payday in Williams Grove Speedway’s Tommy Hinnershitz Spring Classic for sprint cars on Friday night. The victory was the second for Smith in the Williams Grove event having taken his first in 1998. 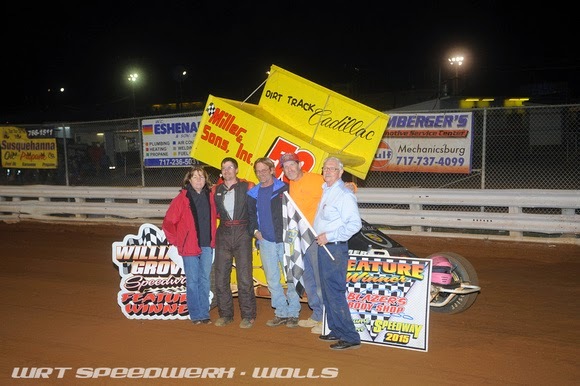 In the 20-lap super sportsman feature Paul Miller took the win in convincing style after getting by Russ Mitten early. Smith started second in the 30-lap Tommy Classic main but couldn’t out pace polesitter Brent Marks when the race began. Marks led the field into traffic with eight laps recorded and although Smith was able to keep the leader in sight he failed to make a bid for the lead. The events first caution flag unfurled with 12 laps down when Brian Montieth rolled to a stop on the backchute and by that time sixth starter Greg Hodnett was up to fourth in the field. Smith challenged Marks on the inside for the first lap when action resumed but after that the leader got away and again began working traffic as the race neared the 10 to go point. Traffic proved to be Marks’ undoing with nine laps to go when as he tried to put last week’s winner Rodney Westhafer a lap down, the pair made contact in the third corner, resulting in Marks backing into the outside wall. And with that, a total of three of the top five running cars were sidelined and the edge was taken off the race as Dietrich got caught up in the crunch-up along with Blaney. Out of the fracas came Smith as the new leader with Hodnett now second followed by Aaron Ott, Lucas Wolfe and Alan Krimes. Smith streaked away on the restart to cruise to big win over Hodnett, Ott, Krimes and Wolfe. Sixth through 10th went to Lance Dewease, Cory Haas, Mark Smith, Steve Buckwalter and Pat Cannon. Heats went to Austin Hogue, Smith and Rick Lafferty with Buckwalter taking the consolation race. Fast time was set by Hodnett with a lap of 16.730 seconds. Mitten started on the pole of the super sportsman main and led when action began as fourth starter Paul Miller drove up to second. It took Miller only two laps to muscle by Mitten and get the lead with three down. And from there he had clear sailing although the race was marred by a red flag with six laps to go when rookie Nate Young vaulted out over the first and second turn fence, escaping injury. Seventh starter Scott Geesey finished second followed by Mitten, Scott Dellinger and Chad Creswell. Sixth through 10th went to Frankie Herr, Kenny Edkin, Mike Enders, Bobby Hockenberry and Chad Trout. Heats went to Geesey, Mitten and Miller. 410 sprints, 25 laps: 1. Stevie Smith, 2. Greg Hodnett, 3. Aaron Ott, 4. Alan Krimes, 5. Lucas Wolfe, 6. Lance Dewease, 7. Cory Haas, 8. Mark Smith, 9. Steve Buckwalter, 10. Pat Cannon, 11. Tim Glatfelter, 12. Don Kreitz Jr., 13. Austin Hogue, 14. Rick Lafferty, 15. Nicole Bower, 16. Rodney Westhafer, 17. Daryl Stimeling, 18. Troy Fraker, 19. Brent Marks, 20. Danny Dietrich, 21. Dave Blaney, 22. Glenndon Forsythe, 23. Brian Montieth, 24. Gerard McIntyre Jr.